Clark Field Baptist Church is a Baptist church located in Angeles City on the Philippine island of Luzon. It was established in 1959 by military personnel from nearby Clark Air Base, under the auspices of the Foreign Mission Board of the Southern Baptist Convention. In 1991, following the volcanic eruption of Mt. Pinatubo, control was turned over to the local congregation and it continues today as an independent organization. Clark Air Base was the largest of America’s overseas bases. The military provided chapel services for personnel, but in 1958 a group met to work toward the establishment of an English-speaking Southern Baptist church. These efforts were spearheaded by the Women’s Missionary Society (already founded at Clark in 1957), local missionaries already in the country, and a loyal group of members drawn from military personnel and their wives. 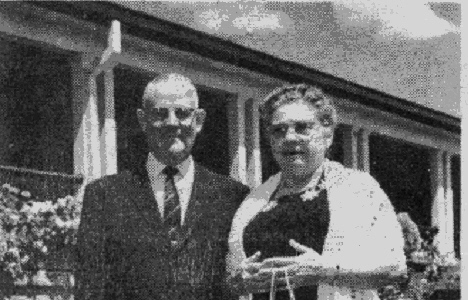 In November 1958 the group formally requested funds from the Southern Baptist Convention Foreign Mission Board (FMB) to construct a church, and asked for a missionary couple to lead the congregation. While awaiting a response, the group formed a Fellowship. Early meetings were held at base chapels. Since a typical military tour at Clark was two years, military personnel were frequently rotated back to the U.S. -- the leadership and membership of the Fellowship was continually changing. In June 1959 the group learned that Rev. J. Allen Smith and his wife Frankie had been appointed missionaries to the area, and Rev. Smith met with the Fellowship for the first time in O ctober 1959. The Water Works building in Balibago was secured as a meeting place shortly thereafter. 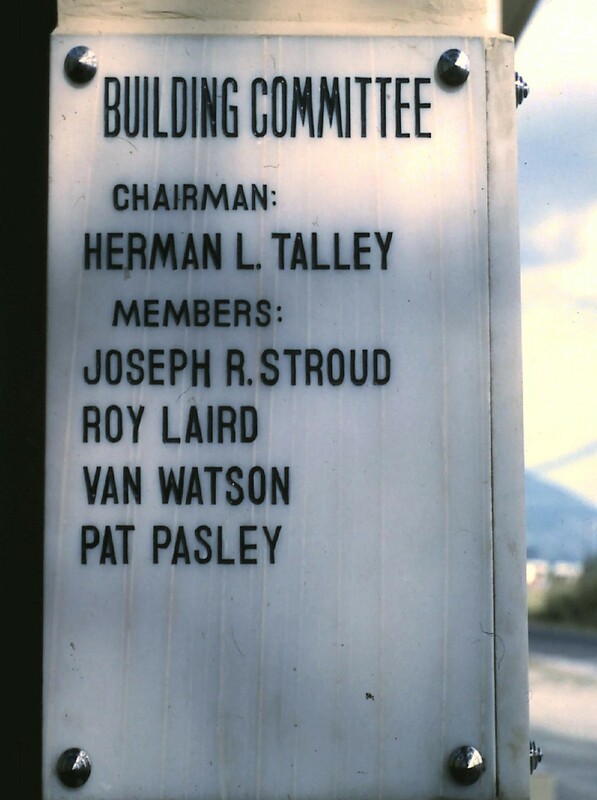 The building committee was composed of chairman Herman Talley, Joseph Stroud, Roy Laird, Van Watson, and Pat Pasley. In November 1959, the FMB purchased land along First Street in Balibago just outside the main gate of Clark Air Base, for construction of a church. By December the fellowship had organized itself into Clark Field Baptist Church (CFBC) with 28 charter members, later expanded to 37 before charter membership was closed in January 1960. The Water Works building quickly became too small, so a temporary building was built on the back of the new property and first used in April 1960. SOME EARLY PICTURES. These photos were included in the booklet published for the dedication of the church. Picture 1 : Building committee members Joseph Stroud, Herman Talley, and Roy Laird. Van Watson and Pat Pasley were also on the committee, but had already rotated home when the photo was taken. Picture 2: An early meeting, believed to be at the Waterworks building. Picture 3: A group shot of charter members. A detailed picture and list of charter members and their children is available here. Picture 4: The temporary building, built at the back of the church lot. More construction photos are available here. Picture 5: Dedicating the cornerstone. Herman Talley, Elsie Talley, J Allen Smith, Betty Laird, and Charles Phillips..
Construction on the church was started in June 1960. The first deacons were ordained the following September. 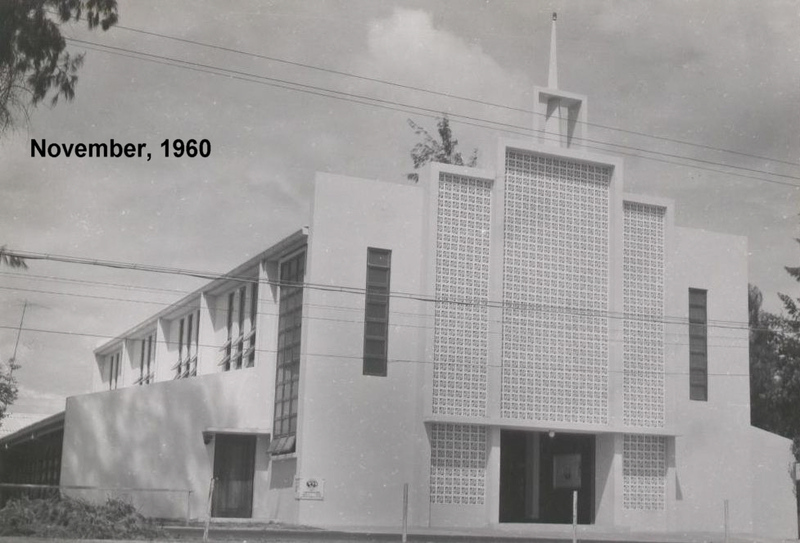 In November 1960 the completed church building was occupied for the first time, and the formal dedication took place the following February. Only two years had passed between the first organizational meeting and the occupation of the new building. 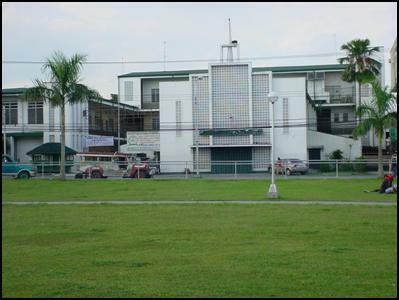 The new building was located on First Street, Balibago. It faced north and was clearly visible when drivers turned off the National Highway onto Checkpoint Road, headed toward the base. It was built by Metro Construction Company and Associates of Quezon City and made mostly of cement brick, with Philippine mahogany used between exposed beams. The floor was inlaid cement tiling splash-brown in color. The design was a central sanctuary with wings on either side. Seating capacity was 400, but each wing had classroom areas whose folding doors could be opened to provide extra seating during services. The wings extended beyond the sanctuary to provide extra spaces: on the west, the church office and pastor's study, and on the east a library room. At the front was a raised platform for the pulpit and guest seating, and a choir area seating 30. Behind the choir was a baptistery and two dressing rooms. A false balcony was put in place, and a functioning balcony was in operation by the early 1960s. The pulpit furniture was modeled on a pattern from the L.L. Sams & Sons furniture company of Waco, Texas which was founded in 1898 by a Baptist minister. The pews were modeled after a sample from the Southern Desk Company of Hickory, North Carolina. The actual construction was done by Henson's Woodcraft, a local company. All the wood was handmade with a natural finish from Narra, an exotic hardwood local to the Philippines. Figures recorded at the time show costs of the lot at 24,000 PHP and the building 110,000 PHP. CFBC operated as a traditional Southern Baptist church. Rev. J. Allen Smith became the first pastor; the pastor and deacons spearheaded planning for the church, and the congregation exercised its input in regular business meetings. The FMB still appointed the pastor and held legal ownership of the property, but with the church's rapid growth it was able to pay back to the FMB a large part of the cost for land and buildings. Even before CFBC was an official church mission work was being done in the area around Angeles City. 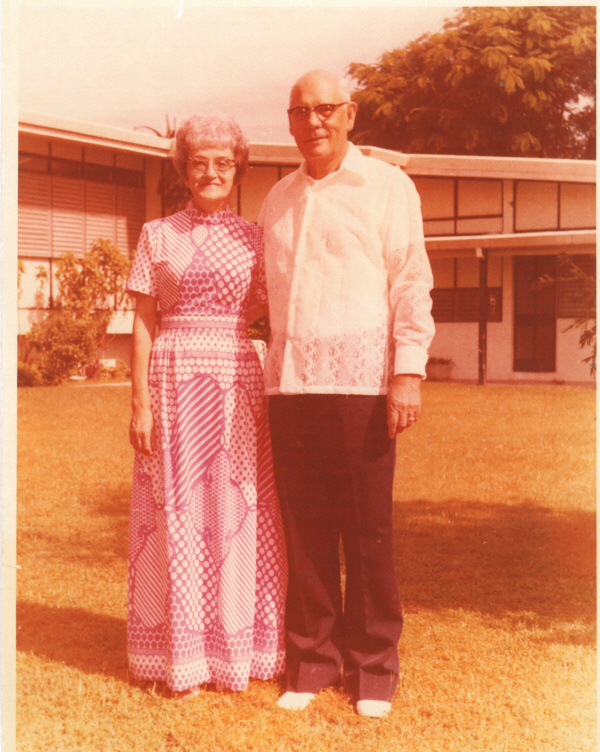 Missionaries Bill and Helen Tisdale had come to Tarlac to work with mission-minded military people in the area, and it was this group along with the Women's Missionary Society at the base that started the push to build the church. By 1963 eleven barrio mission points established by CFBC were active under the leadership of Charles Sumner. Native members and converts often contributed effectively, providing logistic and translation assistance in addition to preaching. As missions grew in size, natural leaders tended to rise from among the converted and missions sometimes developed into churches. CFBC often provided the funding for construction in these areas. Throughout the 1950s and 1960s the area around Clark Air Base was relatively safe for Americans to both live and travel off the base. During the terms of presidents Macapagal and Marcos the American presence was seen as an economic boon, providing opportunities for employment as well as tourist dollars. The safety and freedom of movement in this period made it possible for much of the mission work to be accomplished. Mission work was sometimes hampered by resistance of landlords and property owners to Baptist activities. CFBC eventually became one of the FMB's largest English-speaking churches. It drew from the military personnel who came through Clark Air Base, and it tended to attract those passionately interested in evangelism and church building, for whom the generic religion of the base chapel was insufficient. It cemented people together by providing a home and a family for those whose physical home and family were thousands of miles away. The distance also kept at bay some of the growing materialism in the postwar U.S.: much of current culture filtered in fitfully through few media outlets in the early days (not until 1983 was live U.S. television available by satellite). Living conditions were spare by U.S. middle class standards, and cultural activities were limited to what the base could provide. Those who came under the spell of CFBC found new ways to use their off-duty time, ways that seemed higher and greater. For many of them it was a life-changing experience. The church's effect in the barrios and towns where its missions reached can be seen today in the number of those churches still operating. But perhaps even more profound was the effect it had on the church members themselves. A number of CFBC's former members would return multiple times, and some would turn to full time missionary work after retiring from the military. Most would return to the U.S. and apply their fervor to ministry and church-building all across the country. Back in the U.S., small clusters of former members would form circles who kept in touch as the years took their toll -- many would look back at their CFBC experience as a powerfully formative time in their lives, when they were farthest from home but closest to God. The church continued to grow: five nearby houses were rented to accommodate Sunday school classes. 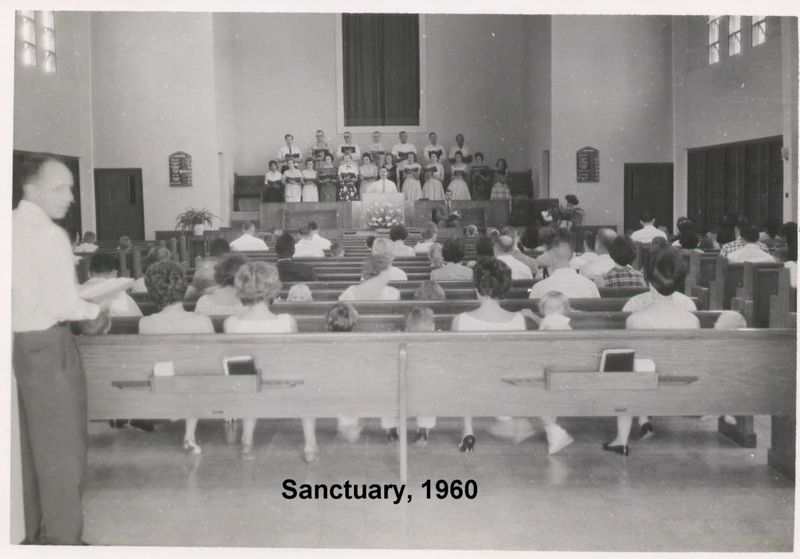 In January 1963 a request was made of the FMB for funds to build an educational building adjacent to the sanctuary. Two worship services were being held to alleviate crowding, and a second Sunday school session was added. Yet crowding continued. A two-story educational building was approved and planned by the building committee, chaired by Bob Richey. Much of the cost of the building would come from the Lottie Moon Offering. A furlough after four years was traditional with the FMB, so in 1963 J Allen Smith and his family returned to the U.S. With this, the founding period of the church ended. CFBC was in solid financial condition, had strong lay leadership with a faithful and growing congregation, and administered mission points throughout the region. For the remainder of this document, the history of the church will be organized by the individuals who served as pastor. The details included in each section are based upon telephone and email contacts with former pastors and with what is now called the International Mission Board (IMB) of the Southern Baptist Convention, as well as the memories of missionaries and church members who were there at the time. New information will be added as it becomes available -- those who can contribute facts or photos, or offer corrections, should contact acemoonbeam1@yahoo.com. It should be noted that the bulk of the text of this document was written in 2009. 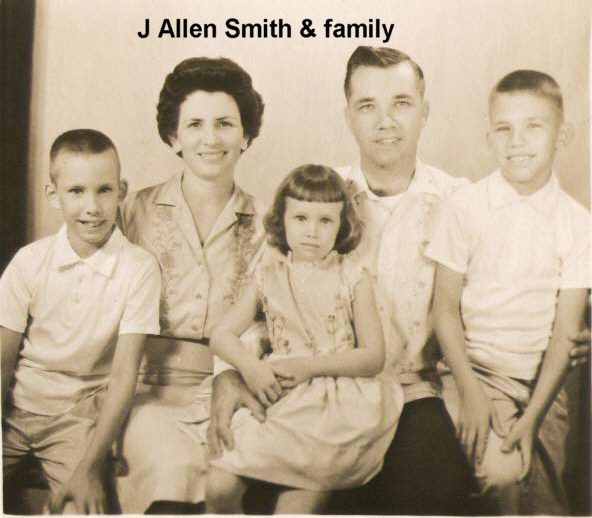 The first year of Allen Smith's furlough was accepted by John Abernathy -- he and his wife Jewell already had emeritus status, having spent over 40 years as missionaries in China and Korea. 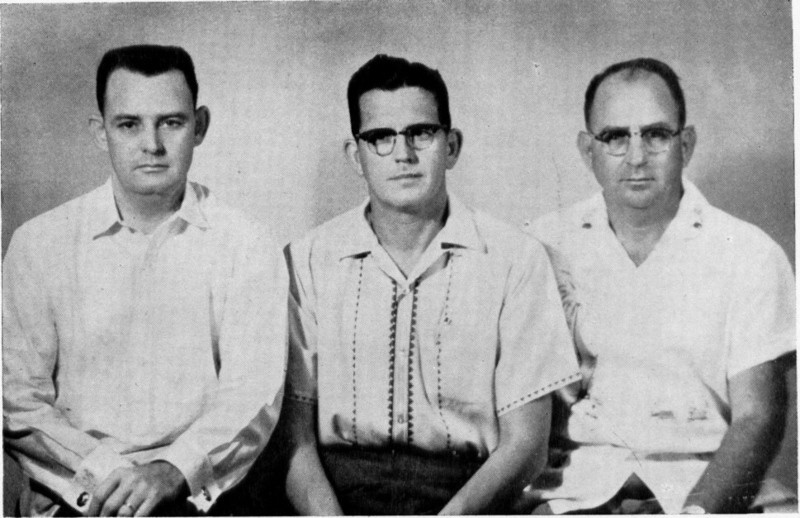 They arrived at CFBC in July 1963. The Abernathys' great adventures in the Orient were chronicled in the 1974 book Living Sacrifices: A Missionary Odyssey by Jesse C Fletcher (ISBN 080547210X ). Abernathy was exceptionally kind and compassionate, and was well-loved by the congregation. His favorite Bible verse at the time was Jeremiah 33:3: "Call unto me, and I will answer thee, and show thee great and mighty things which thou knowest not." In later years they were based at First Baptist Church of Hot Springs, Arkansas. John died in 1973, and Jewell in 1977. The need for space during this time was growing critical, and the rush was on to finish the educational building. The second floor of the new building was put to first use in February 1964 and the first floor was occupied in April, even though it was still uncompleted. The 11,000 square foot educational building was formally dedicated and the cornerstone unveiled by Dr. Abernathy in May 1964. As time for the Abernathys' departure back to Hot Springs approached, health issues with J Allen Smith's youngest son made it necessary to extend his furlough another year. While the church awaited the appointment of another interim pastor the president of the Baptist seminary in Baguio City, Albert Walker, agreed to fill in on weekends. When he was unable to make the trip, a language student from Manila, Grover Tyner, filled in. Tyner's records indicate that he preached 13 times at the church between May and November; he also recalls assisting the church in the writing of its bylaws during Dr. Abernathy's tenure. Walker and Tyner kept the pulpit filled from July until October 1964. Walker was the 2nd president of the seminary; he had a heart attack in 1965 and died shortly after returning to the states. Upon his illness, Tyner became president and served for 22 years. Grover Tyner is retired and living in Georgia. A. Hope Owen and his wife Sue arrived in October 1964 to take the second year of Allen Smith's sabbatical. Owen had been pastor of First Baptist Church in Plainview TX before spending ten very productive and progressive years as president of what is now Wayland Baptist University in Plainview. He retired in 1963, and then the couple did something they'd always wanted to do: go to the mission field. After their time at CFBC, they spent some time in Lubbock and then returned to Plainview. Owen died in 1981 at age 84. A church report published in 1964 showed that in the five years since its founding, membership had grown from 28 to 271 and Sunday School attendance had grown from 65 to 412. Allen Smith returned from furlough. In March of 1968 work was begun on the second educational building. It was finished and dedicated on July 21, 1968. According to FMB minutes, Carl W. Houston was called to serve beginning in July 1969. He was from Texas. After his service at CFBC, Houston was appointed as a regular missionary. He is retired and living in North Carolina. Smith returned to the church until 1973, when illness forced him to resign. Tolleson's appointment is first mentioned in the July 10, 1973 minutes of the FMB. "Papa T" was a retired pastor who was serving as the Director of Missions for the Rehoboth Baptist Association. He lived in Sulphur Springs Texas, where his son Charles was on the staff of First Baptist Church. He went to the Philippines in 1973 to serve for the year at Clark. Born in 1906, Jay Tolleson was 67 when he and his wife Betty ("Mama T") took the reins of the church. He was known for his love of fun and his affinity for people, especially children. He was a great believer in the Lottie Moon Christmas Offering, which sponsors missionaries. One of the stories about him involves the church's failure to reach its Lottie Moon goal; he closed the doors and announced that no one was leaving until the goal was met. It was. According to the minutes, the Tollesons later served at Marianas Baptist Church in Guam. Papa T died in 1994. 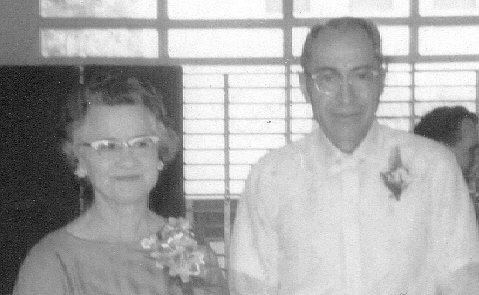 Dickens and his wife Karr La were pastoring International Baptist Church in Manila when he first heard of CFBC. Back in the states at seminary, he heard the pastor's position was open, and they went to Clark in 1975. Dickens recalls that the building was renovated and air conditioned during this time. Filipino and American teams continued to do evangelistic work across Central Luzon -- notably, among the headhunters in Quezon province. The Blackwood Brothers gospel group visited Clark, and the Billy Graham Evangelistic Association teamed with CFBC to conduct crusades on the base and in the park across from CFBC. The Dickens family went on furlough in 1979. Dickens recalls that Kelly Johnson served as pastor during his furlough. After returning for a time Dickens left in 1980 to go to the seminary in Baguio. Today Dickens coordinates mission work for the Cooperative Baptist Fellowship. Kelly Johnson grew up in Alabama. He attended what is now Samford University in Birmingham, and later Southwestern Baptist Theological Seminary in Fort Worth. He pastored several churches in Alabama, and also in the west and northwestern regions of the U.S. In his sixties he applied to the FMB and he and his wife Louise were assigned to Clark Field for nearly a year, then to Japan. His son David, a professor of genetics, also did missionary work and served as a faculty member of the Japanese Baptist University (he is now a professor at Samford). Kelly enjoyed his Clark experience, describing the Clark Field church as "a wonderful missionary minded American Air Force congregation." He died in 2002 at age 88. One of the servicemen who joined the church and was baptized by Kelly Johnson was Wilson Wickiser. He was a clerk at the USAF Regional Medical Center on Clark. Wickiser would later become a minister. J Allen returned in 1978. Until Dean Dickens left, he worked in the missionary field at Tarlac. Then he resumed pastoring duties for a time until health issues again forced his departure in 1982. Though he would recover well enough to go on to another mission field, this was his last time at the church that he helped found. J Harold Brown of Pensacola FL is mentioned in the July 13, 1982 minutes of the FMB. It is stated that he will serve as interim pastor effective August 1, 1982. In the minutes of August 8, 1983, it is stated that he completed his service on June 30, 1983. John Dill and his wife Nancy are from the SC area. Dill was a very popular pastor. Christopher Calalang, later the first Filipino pastor of CFBC, served as language teacher to John. In 1984, Chris began studying at the Philippine Baptist Seminary in Baguio City after graduating from Angeles University Foundation with his A.B. degree in mass communications. 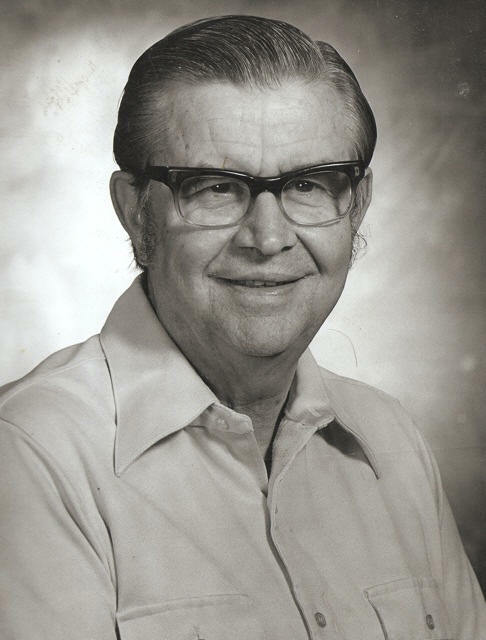 Don Jones was an auxiliary missionary. He was the only missionary to be paid by the church for his support. Jones was from the Spartanburg SC area. He is deceased. 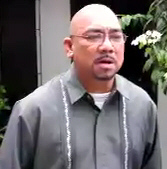 It was during Jones' time that Christopher Calalang graduated from the seminary and was ordained into the ministry (1988). Don Jones and Dean Dickens were members of the ordaining counsel. Chris was called by CFBC to serve as the director of local missions in 1988. The Spiveys -- Marvin, Lynn and their daughter Alicia -- arrived in October 1987. They had been at the International Baptist Church in Hong Kong until called to CFBC. This was a tense time since President Marcos was recently deposed and there was much civil unrest and violence, when led to a restriction of provincial travel by military personnel. The church bought a Toyota Tamaraw which was used by Chris Calalang and Filipino Christians in the church to do mission work in the provinces, and to bring members to Sunday School. Soldiers restricted to the base began working with the base chaplain, a Southern Baptist, to minister to service people. This period saw a major Luzon earthquake on July 16, 1990, which caused much damage and cut off the road to Baguio City. Spivey remembers the challenges and accomplishments at Clark with great warmth. This was a time of growth for the church. CFBC and local Baptists sponsored the Central Luzon School of Theology for training Filipinos to minister in local churches. Spivey estimates that the church population was about 60% Filipino at this stage in its life. In 1989 the Spiveys returned to the U.S. for nine months following his mother's passing -- in the interim, Spivey recalls that Bob Nash and Wendell Smith served pastors. In December 1989 the Spiveys returned to pastor the church until leaving the church in October 1990 to work in Las Pinas, a city to the south of Metro Manila. They flew out of the Philippines four days before Pinatubo erupted. Wendell Smith and his wife Betty had been missionaries in Indonesia for 22 years, until a change in Indonesian government policy made it necessary for them to leave. They stayed for four months. He enjoyed the preaching and the fellowship of the church very much. After a short furlough and some language study, the Smiths went on to serve in Laguna for 9 years until their retirement in Kentucky. Nash was president of the Philippine Baptist Seminary in Baguio City in the early 1990s, and he would drive down to Angeles on Saturdays. During much of this period the Philippines was undergoing civil unrest and those living on-base could not reach the church safely. Sometimes on-base families would be able to reach the mission house (parsonage) and services would be held there. Services continued at the church for those living off-base and for the Filipino members. Nash recalls the church doing some mission work among the people on Mt. Pinatubo, as well as among the Negrito people. During one of his trips in the mountains Bob was caught in an earthquake, perhaps the big 1990 Luzon quake. He was stranded in a local village for several days, and rescued by helicopter. Nash lives in Georgia, and is still working in ministry and interim pastoring. Rick is originally from Alabama. He and his wife Beth were missionaries in New Zealand, and had just finished establishing their final church when they were asked to take the interim position at CFBC. They arrived in January 1991, just as the base was gearing up for Desert Storm. Due to security concerns the base was under lockdown, and for much of the time those who lived on the base were unable to leave. 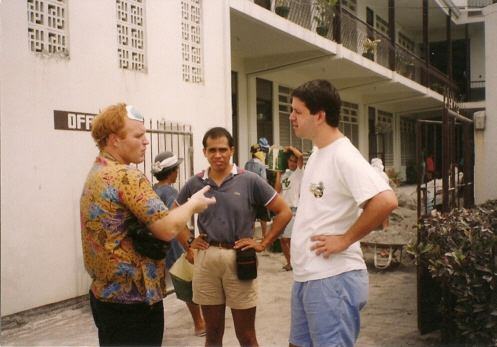 Rick lived in the mission house and preached to a predominantly Filipino audience. He remembers going on the base to do a lot of Bible study sessions. He departed the Philippines for the U.S. 11 days before Pinatubo erupted, and watched it on TV with the rest of us. Rick works with the International Mission Board as a deployment consultant. David was the last American pastor assigned to CFBC. 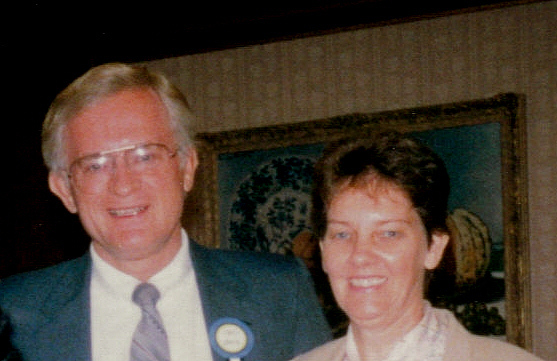 Originally from Texas, he and his wife Karyn were missionaries in Samoa and Fiji. They went to the Philippines as dorm parents at Faith Academy, a Baptist school in Manila. From there they were assigned to pastor CFBC after Rick Wolfe departed. They had not been in Angeles for a week when Mt. Pinatubo erupted; David never preached a sermon before he essentially became a relief worker. The church and pastor's home were heavily damaged by falling ash. When it rained the ash turned to heavy mud and when it dried it was like concrete -- David recalls the falling mud was so heavy it burned out the windshield wipers on his car. The Philippine Baptist organization set up a tent-city relief center some distance from Clark Field for providing medical aid, food and helping people try to find their families -- David sent Karyn, then expecting, back to Manila and spent most of his time at the relief center for weeks following the eruption. Only a skeleton security crew remained at the base by now, and the looters had already begun to take the place apart. David went back to the church several times to help with the cleanup and repair (he's the one with the red hair). After eight grueling weeks of relief work, David and his family were furloughed back to the U.S. David has since gone into the prison ministry, and works as a chaplain in a federal detention center. By early 1979 sovereignty of Clark Air Base was transferred to the Philippines, but growth and remodeling continued under joint command. According to one observer, by the mid-80s Clark had become one of the most urbanized of all America's overseas bases. In February 1986 the U.S. military at Clark aided in evacuating President Marcos to Hawaii where he took up exile. In the days leading up to this, the Philippines experienced much civil unrest and there was considerable sentiment that Americans should leave Philippine soil. Communist groups were among those vying for political power. The freedom to move about the countryside without fear, which had enabled so much of the early American-manned mission work, began to evaporate. Observers note that the area of Balibago directly behind the church became dangerous as Communists set up safe-houses. Americans were increasingly restricted to the base as a result of increasing violence. The mission work of the church was shifted to the shoulders of the Filipino members. When it became obvious that Mt. 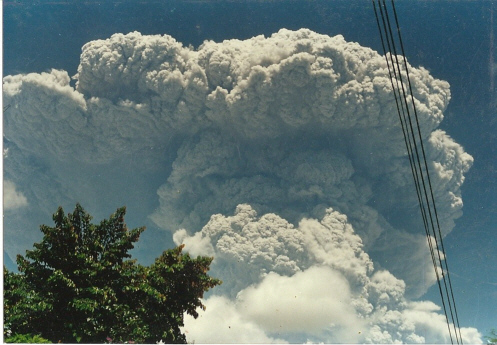 Pinatubo was going to erupt, Clark was evacuated of all but security personnel on June 10, 1991. Two days later a long series of eruptions began. Many of the structures on the base were destroyed by the enormous ash fall, and heavy looting began almost immediately after the main evacuation. It was not clear when or if military personnel would return, so the future of CFBC hung in the balance. The U.S. still appreciated the strategic importance of Clark Field but faced a long and expensive cleanup as well as difficult negotiations with the Philippine government. In November 1991 the Philippine legislature sealed the fate of CFBC by rejecting an extension of the treaty that provided American leasing of the base. With the writing on the wall, the remaining Filipino congregation of the church called Chris Calalang to be their pastor in September. In a ceremony with representatives of the FMB present, CFBC was turned over to the local congregation. And Clark Field Air Base was formally transferred to the Philippine government on November 26, 1991. Christopher Calalang entered the Philippine Baptist Theological Seminary in Baguio City in November of 1984 right after he graduated from Angeles University Foundation with his A.B. Mass Communication degree. He graduated in March 1988 at PBTS. He was called by the church to serve as Local Missions Director of CFBC in April 1988 and was ordained into the ministry on May 22, 1988. Dr. Don Jones led the ordination. The members of the ordaining council were the following: Dr. Paul B. Johnson, president of PBTS; Dr. Dean Dickens, former pastor of CFBC and PBTS preaching professor, Dr. Val Gonzales, Registrar at PBTS, Dr. Noel Tiano, Professor at PBTS. Chris has been the pastor at CFBC since 1991. The Pinatubo disaster caused some of the local congregation to seek homes and jobs in safer areas, and the next few years were difficult ones. As conditions slowly improved the church took up the status of a working Philippine Baptist church, and experienced all the difficulties and rewards that other Baptist churches face in their lives. In December of 2009, Clark Field Baptist Church will be a half-century old. It had existed as an American mission church for most of its life, a spiritual home for evangelism-minded military personnel. Pastor Chris joined the church during the American era, still communicates with former pastors, and can draw on the experience of those who went before. But one day leadership will pass to the next generation who have no direct knowledge of those who built the church and faithfully served her. It is hoped that this website will inform and inspire them for years to come. Amen.